Accompanied by a substantial bibliography, this is an essential guide for researchers and advanced students in academia and research working in synthetic organometallic, organic and inorganic chemistry, materials chemistry and catalysis. Michael Lappert is Emeritus Research Professor of Chemistry at the University of Sussex. A graduate of Northern Polytechnic, his B.S.c. was followed by a Ph.D. (with W. Gerard to which in 1960 he added a D.Sc. (University of London). He has been at Sussex since 1964, having previously been at UMIST (1959-1964). He was the recipient of the first chemical Society Award for Main Group Metal chemistry (1970) and then of the chemistry (1976); with the RSC (he was its Dalton Division President, 1989-1991), he has been a Tilden (1972), Nyholm (1994), and Sir Edward Frankland (1998) Medallist and Lecturer. In 2008, he was awarded the GDCh Alfred-Stock Prize. he was elected FRS in 1979 and was award an honorary doctorate from Ludwig-Maximilians-Universitat (Munchen, 1989). With co-workers he has published 2 books, edited 4 others, and more than 780 papers and reviews and a few patents on various aspects of inorganic and organometallic chemistry. Philip Power received a b.A. from trinity college Dublin in 1974 and a D. Phil, under M. F. Lappert from the University of Sussex in 1977. After postdoctoral studies with R.H. Holm at Stanford University, he joined the faculty at the department of Chemistry at the University of California at Davis in 1981, where he is a Distinguished Professor of chemistry. His main interests lie in the exploratory synthesis of new main-group and transition-metal complexes. A major theme of his work has been the use of sterically crowded ligands to stabilize species with new types of bonding, low coordination numbers, and high reactivity. He has been the recipient of several awards including the A. P. Sloan Foundation Fellow (1985), Alexander von Humboldt Fellowship for Senior U. S. Scientist (1992), Ludwig Mond Medal of the Royal Society of Chemistry (2005), F.A. Cotton Award in Synthetic Inorganic Chemistry of the American Chemical Society (2005) and was elected Fellow of the Royal Society of London (FRS) (2005). Andrey Protchenko was born in 1961 in Rostov-on-Don, Russia. A graduate of the Moscow State University (Russia) in 1983, he carried out his doctoral work at the Karpov Institute of physical Chemistry (Moscow) and completed his Ph.D. in chemistry (1997) at the Razuvaev Institute of Organometallic Chemistry (Nizhny Novgorod) under the supervision of Prof. M. N. Bochkarev studying naphthalene complexes of the lanthanides. In 1998 he joined the group of Prof. M. F. Lappert at the University of Sussex (England) working on a series of projects (Royal Society, EPSRC and Leverhulme trust grants) involving lanthanide redox chemistry based on cyclopentadienyl, N- and N, N' -centred ligands. Alexandra Seeber, nee Pickering, was born in 1979 in Lichfield, UK. After graduating in chemistry at Keele University in 2001 and completing a Ph.D. in Inorganic Chemistry into the design and synthesis of ligands for the controlled self-assembly of tr5ansition metal complexes at the University of Glasgow (Scotland) in 2004, she carried out postdoctoral research into nanoparticle synthesis at the University of California, Davis with Prof. Philip Power under a Department of energy grant for the Design of high surface area materials as hydrogen storage vessels. Alexandra Seeber has worked since 2006 in Research and development in the catalysis department at BASF in Ludwigshafen (Germany). 1.1. Scope and Organisation of Subject Matter. 3. Beryllium and the Alkaline Earth Metal Amides. 4. Amides of the Group 3 Lanthanide Metals. 4.2. The Pre-1996 Literature: Anwander's Review. 4.3. The Recent (Post-1995) Literature. 5. Amides of the Actinide Metals. 5.2.Neutral Amidouranium (IV) and Thorium (IV) Complexes. 5.4. Neutral Mixed Valence (UIII/UIV), UII UV and UVI Amides. 6. Amides of the Transition Metals. 6.2. Transition Metal Derivatives of Monodentate Amides. 6.3. Transition Metal Complexes of Polydentate Amido Ligands. 6.4. Other Chelating Amido Ligands. 7. Amides of Zinc, Cadmium and Mercury. 7.2. Neutral Homoleptic Zinc, Cadmium and Mercury Amides. 7.4. 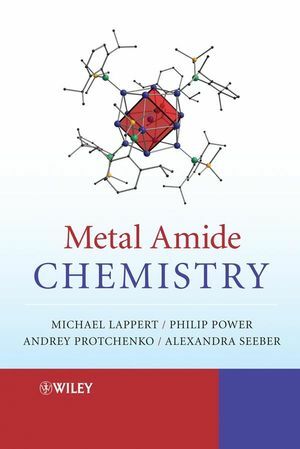 Lewis Base Complexes, Chelated Metal Amides and Heteroleptic Amido Complexes. 8. Amides of the Group 13 Metals. 9. Subvalent Amides of Silicon and the Group 14 Metals. 9.3. Amidometal(II) Chemistry [Ge(II), Sn(II), Pb(II)]. 9.4. Dimeric Metal(III) Imides: Biradicaloid Compounds. 9.5. Higher-Nuclearity Group 14 Metalloid Clusters having Amido Ligands. 10. Amides of the Group 15 Metals (As, Sb, Bi). 10.2. Mononuclear Group 15 Metal (III) Amides. 10.3. Oligomeric Group 15 Metal Imides. 10.4. Mononuclear Group 15 Metal (V) Amides. 10.5. Group 15 Metal (III) Macrocyclic Imides. 10.6. Miscellaneous Group 15 Metal-Nitrogen Compounds.